Mercy Me. I’m not a fan of The Walking Dead. However, the past couple of weeks have left me believing our tribe would be in the running if the show ever did a casting call in South Dakota. “Crud” re-visited our home and my zombie-like state left me desperate in the arms of Larry the Talking Bird. My planning self wanted to stick to the schedule and post a recipe today. After all…Wednesday’s is DoAhead Dining. But here’s the thing, I had a post ready to share on Monday and not sharing it felt like having an amazing dessert stuck in a purgatory called blog drafts. You can only pass up dessert so many times (even if its just in your head). No, this baby needed to be published——-today. Here’s the post I wanted to share two days ago. Before I let fingers fly over the keyboard I need to write something of a disclaimer. My heart tugs at my head with concern that my DoAhead sisters will think I’m all braggy about the birthday card Doc gave me. Not true. No, today’s share is about me wanting desperately to speak something into your heart that a lil’ ol’ card on the kitchen counter spoke to mine. Read on friend. I have a feeling this card was for you. 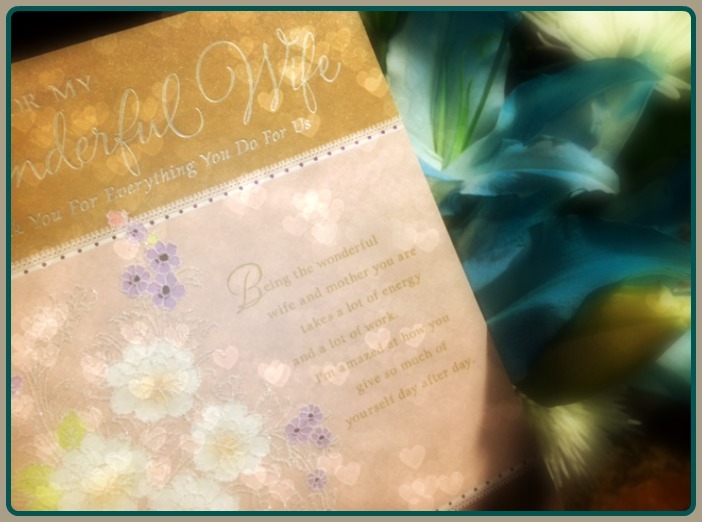 “Being the wonderful wife and mother you are takes a lot of energy and a lot of work. I’m amazed at how you give so much of yourself day after day. With your good, generous spirit you fill our lives with light. That thought resonated deep in my heart. Then I remembered a scene from one of my favorite books (The Sacred Romance~Brent Curtis & John Eldredge). The meanderings in my mind were getting deep. I needed to chew on these thoughts way more than my Orbit gum. How about you? Have you ever wondered why it matters so much to matter? I have. As secure as I am in who I am and even more importantly whose I am, I still wonder. And then I get a birthday card that reminds me. Being noticed isn’t nice…it’s necessary. It is an intimacy we all desire. It’s an honest admission of our need to be understood and loved just the way we are. Being noticed is about being in a relationship. Here’s where it can get tricky. The truth is, if we’re not careful we may be tempted to seek praise and admiration in unhealthy ways from unhealthy sources. In the end, those means never satisfy. I know…I’ve tried. Don’t get me wrong, the card from Doc blessed my socks off. You can bet it’s going in the top drawer of my nightstand. But…there’s only one source of true glory. It comes through the person of Jesus Christ. It leaves you humbled and nearly broken once you sense how deeply you’re loved. It’s a paradoxical glory that lifts your spirits high as your knees drop low—and you scrub cider off the kitchen floor of a home located in an underpopulated state. No one else is present. Not a single soul is around. He notices you and I. He knows when we rise and rest. He knows when we falter and fail. He knows when we hunger and hurt. He knows when we manage and master. He knows when we just need to know…He knows. And so that’s where I landed this grand birthday. A moment alone in the kitchen, hair pony-tailed, dishtowel draped over my shoulders, muffin crumbs at my feet, cider sticking to my socks, acknowledging a birthday card that reminded me God acknowledges me. May we all be encouraged in the truth that He knows us, loves us and wants more than anything for us to live life believing it. Since I’m a bit topsy-turvy this week I’m hoping you won’t mind my sharing Angie Ryg‘s Inspire Me Monday on Wednesday! She has some give away’s this week that are the bomb!